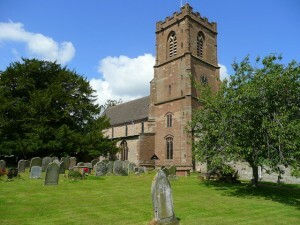 “MUCH MARCLE, (was Marcle, Much -RL 2003) a parish in the hundred of Greytree, county Hereford, 5½ miles S.W. of Ledbury, its post town. It is situated on the high road to Ross, and contains the chapelry of Yatton. It formerly belonged to the Lacier and Mortimers, who had a castle here. At Marclay Hill is a spot called the Wonder, where a singular landslip occurred in 1575. The hill finally placed itself in a higher position, sweeping everything away in its progress. The original site is now a chasm 40 feet in depth and 30 in length. The inhabitants are chiefly engaged in agriculture. The land is partly in hop grounds. The Church of England parish church of St Bartholomew is 13th-century with historic carvings and an ancient ‘hollow’ yew tree thought to be at least 1500 years old. The church contains the tomb of Blanche Mortimer, of the dynasty of Marcher Lords, the Mortimers; the tomb bears the Mortimer coat of arms. She married Peter de Grandison. The Kyrle Tomb is located in the centre of the chapel of Much Marcle Church. The recumbent effigies are that of Sir John Kyrle of nearby Homme House and his wife Sybil Scudamore. Sir John was born in 1568 and served as High Sheriff of the county in 1609. He was created a baronet in 1627. Later he protested against the payment of Ship Money, and in the English Civil War his sympathies lay with the Parliamentarians. He died in 1650. Hellens Manor, which is in the centre of Much Marcle, is a monument to much of England’s history. In 1096 the manor was granted by King William II to Hamelin de Balun, whose family later witnessed the signing of the Magna Carta. It contains a wealth of period furnishings, paintings and decorations, as well as a Tudor garden. The Manor plays is open to the public and provides a venue for educational, musical and literary events the year round. The other principal seat is Homme House, surrounded by ancient parkland. There are also two ruined medieval castles in the parish. One is Mortimer’s Castle, also known as Much Marcle Castle. The second is Ellingham Castle which is situated at Quarry Wood.